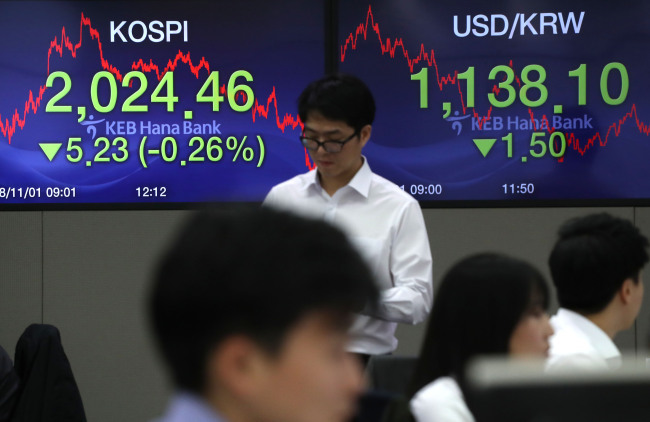 South Korean stocks will have upward momentum next week, albeit limited, as economic and political uncertainties that had weighed down the market have cleared up after the midterm elections and the interest rates decision in the United States, experts here said Saturday. The benchmark Korea Composite Stock Price Index (KOSPI) closed at 2,086.09 on Friday, down 0.47 percent from the previous week. All eyes were on the midterm elections in the U.S. this week, which had added volatility to the local market. On the first day of the week, the index started lower on renewed concerns over trade disputes between the U.S. and China as well as uncertainties heading into the high-stakes voting. Though optimism over eased woes related to trade frictions pulled up the local index on Tuesday, the gains were paired the following day after planned high-level talks between Washington and Pyongyang were cancelled abruptly. On the post-election relief, however, the market jumped Thursday before investors took a breather Friday to wrap up the volatile week with a modest fall. “Democrats‘ taking of the House of Representatives somewhat eased concerns over hawkish and often unpredictable policy pushes by U.S. President Donald Trump,” said Kim Byung-yeon, an expert at NH Investment & Securities. Coming into focus next week will be the address by U.S. Federal Reserve Chairman Jerome Powell and developments centered on the ongoing global trade spat. On Thursday, the U.S. central bank kept its interest rates unchanged, but it has signaled a continued tight monetary policy.